We focus on taking the pressure off nerves and getting joints moving so that the body can heal itself and function normally. We want every patient to feel as good as they were designed to feel! And with four clinic locations, in Placentia, Costa Mesa, Garden Grove, and Irvine, care is more convenient than ever! Many people initially have one goal in mind: relief from their pain. So that’s where we always start! Our responsibility is to uncover the source of the problem and suggest a care plan to get you out of pain as quickly as possible. We’re committed to teaching our patients that true health is a journey, not a destination. Our desire is to see our practice members abandon the prevailing sickness model of health in favor of the emerging wellness model. This is accomplished through understanding the value of ongoing chiropractic care. Even more importantly, the chiropractic care we deliver has allowed us to change the lives of people who simply live in chronic pain for years at a time, resigned to a less-than-ideal life. Imagine their surprise and sense of hesitant hope when they’re already feeling 50% better after only five to 10 treatments! Their eventual return to a pain-free state of living is always our goal. Whether you’re a businessman, a weekend warrior or someone’s beloved grandmother, we’re here to help. We focus on family wellness and offer gentle, effective care for newborns, children, adults and seniors to obtain and maintain optimal health. We want our practice members to feel like family, and we want them to bring in their families! We also offer top-quality massage therapy services, using only registered massage therapists with at least a decade of professional experience. We want you to always feel like you’re in good hands! 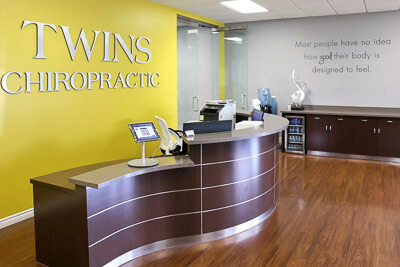 Call us today to find out why our patients love the personal connection they find in our office!